Western Bottle News: P. Pratts "Bitter Witch"
Just who was this "P. Pratt", the mystery man behind the magical Bitter Witch? The first mention of any of Pratt's products was by A. M. McBoyle & Co. Druggists & Chemists, located across the Street from the What Cheer House, at 534 Sacramento St. in S. F. Cal. 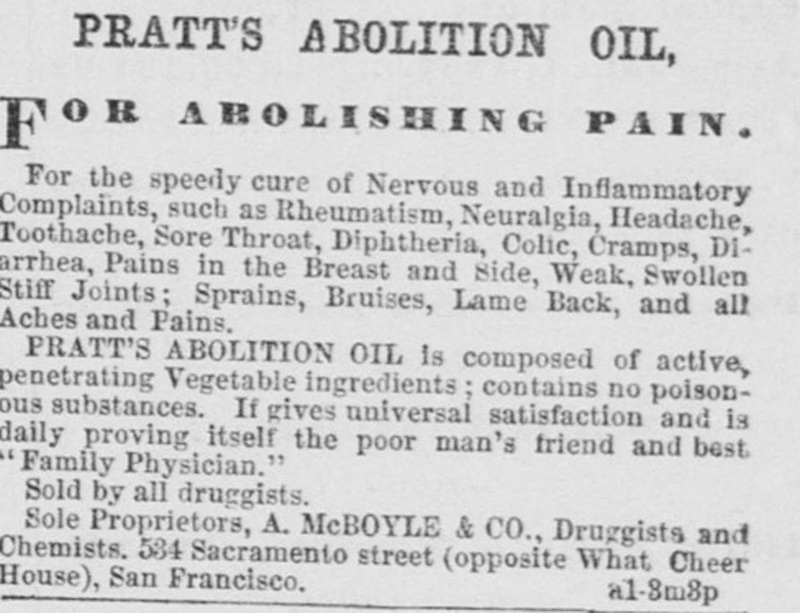 They were pushing Pratt's Abolition Oil in the October 2, 1866 edition of the Daily Alta California. Later, the product appeared in the April 1st 1867 edition of the Sacramento Daily Union. By August of that year, they had expanded their push into the Gold Country and were advertising in Marysville. On December 2, 1867, "Pratt's New Life" made it's debut. This time in the Sacramento Daily Union. 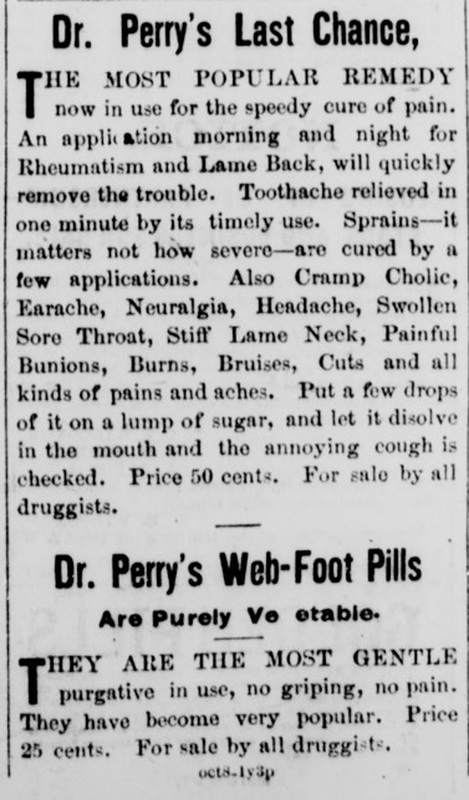 On Oct. 6, 1872, Dr. Perry's Last Chance and Web Foot Pills hit the streets. I first located P. (Perry) Pratt (the actual person) in the 1872 San Francisco City directory. Where he'd been prior to this is anyone's guess. He was living at 710 Sutter Street and, according to the directory, was dabbling, (apparently in a small way as he had no "yellow page" listing) in Patent Medicines. By 1874, he'd moved to 608 Harrison; a mile and a half away. That was quite a distance from the original roof over his head. His occupation continued to be listed as "Patent Medicines". For reasons unknown, 1875 saw yet another move. This time to 25 Silver Street, where he remained until the last reference appears of him as a resident of the "City by the Bay", San Francisco. In addition to the move over to Silver St., the year 1874 also saw the last listings and or advertising for his "cures and nostrums", although his listing in the 1875 directory still states ""Patent Medicines". His final listing is in the 1877 Directory, still residing at 25 Silver, and still dealing in Patent Medicines. What happened to him after this is anyone's guess. As is often the case, the search for P. (Perry) Pratt brought more questions than answers. If "Perry Pratt " sold the Oil from 1866-1877 isn't it interesting that he had three molds made in those 11 years? Of course the first mold is the one with the backwards "S" and is the one we all love. I think it is also very cool to learn that Pratt was Dr. Perry ?!?!? The "Last Chance" is one of the great western medicines...not real rare but so crude and so Western. Mystery of the "Bitter Witch" finally solved.